Are you suffering from teeth loss? Dentures may help you regain lost confidence. As biting aid and as cosmetic enhancement dentures can play a key role in your oral and overall health. There are a number of techniques to restore lost teeth using dentures. Both removable and fixed type of restoration are available. Dr. Haywood, who is specially trained in prosthodontics, can replace your lost teeth using different types of restorations. At our practice in Timonium, we offer high end custom dentures. 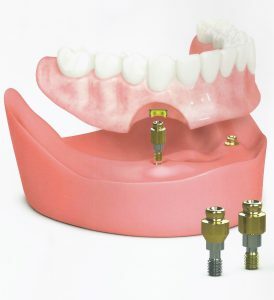 We also offer implant supported dentures and All-on-4. The art of denture excellence was not common 40 years ago when denture wear was at its peak. There have always been cheap dentures, dentists not trained or skilled in putting out an excellent product and the dissatisfaction and pain that goes hand in hand with all of that. A few denture masters have always striven for and achieved incredible comfort, amazingly natural smiles, and a denture that seemingly won’t wear out. All of this is no accident. The branching technique, which is not taught in dental schools, was taught to Dr. Haywood by the world famous Dr. Jack Turbyfill. It goes like this: we make a denture to solve all of your problems first, and then when it is perfect, we make you another one that is finalized and duplicated exactly with the best teeth, the best plastics, and the best lab technicians in the country personally trained by Dr. Turbyfill himself. The denture process takes time and skill. We are experts in solving your difficult denture problems! As an acknowledged leader in cosmetic dentistry, Dr. Haywood knows how to make you look good. We take our time with the denture creation process in our Timonium area practice to get our dentures right. Hence, we deliver to you the best denture you have ever worn, and perhaps the last you will ever own. If you currently wear dentures or soft dentures that do not fit and live in Pikesville, Towson, Timonium or the surrounding area, contact us to discover a whole new experience. False teeth designed by Dr. Haywood in not only look natural, but also are high functioning. Bring us your problem dentures!!! It takes experience and skill in this dying art to solve those pesky problems. Isn’t it about time you have great fitting dentures or even Implants for that matter? Have us make you a quality denture. Finally have the comfortable denture you deserve. For patients who are looking for a more permanent solution to tooth loss, we offer implant supported dentures and All-on-4. 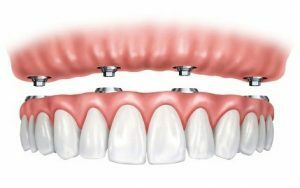 Implant supported dentures use a series of strategically placed dental implants to hold the denture appliance in place. With implant dentures, patients never have to worry about their dentures slipping or clicking out of their smile at inopportune moments. Patients with implant-supported dentures also receive added health benefits, because implant supported dentures provide extra support to the jawbone and prevent bone deterioration. 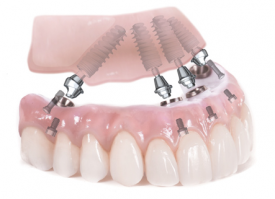 One of our great implant supported denture options includes All-on-4. With All-on-4 we can place permanent dentures in as little as one appointment. The implant-supported denture is the standard of care recognized by the ADA for a lower denture. The retention of the regular superior-quality denture in our office is improved by snapping or locking onto implants placed below the denture. Upper dentures may be locked or snapped onto implants as well, and this will greatly improve the chewing ability in most cases. Sometimes patients with existing dentures may have implants put underneath them. In our experience, however, most denture construction these days is very poor, and the true artists of this craft are disappearing. In our Towson area practice, we often recommend that new dentures be made with proper construction for the best long-term value. To find out more about our dentures or our other restorative dentistry services such as dental bridges, or cosmetic dentistry services such as porcelain veneers, call us at our office today! We serve everyone in the Timonium area, from Towson to Pikesville!